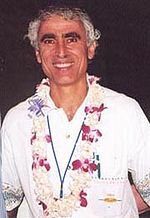 Dr. Michael Salla has a PhD from the University of Queensland in Australia in government affairs (1993) where he specialized in conflict resolution. he wound up as an Assistant Professor at the Center for Global Peace at American University. When his activities involving Exopolitics became popular the University, in 1994, no longer wanted to be associated with him. As only an Assistant Professor, he had no tenure and was kind of, sort of fired and his Peace Ambassador Program was terminated because, the university claimed, he had made 'unauthorized changes.' Well, his 'contract was not renewed,' but, he still is 'connected' with the University and his academic website remains. He just doesn't work there any more. Salla subsequently moved to Hawaii and started his Exopolitics web site initially to display his scholarly work that was not allowed to be placed on his American University web site. He has also established the Exopolitics Institute that offers courses and a number of certificates, including one in Galactic Diplomacy that "provides both the conceptual skills and diplomatic training so you can practice citizen diplomacy in extraterrestrial affairs." Yet another Salla web site is Galactic Diplomacy, founded by Salla and his wife, Angelica Whitecliffe, which, among other things, runs a program swimming with dolphins. It's an, ah, kum-bay-ya moment. You know: "other intelligent species," "ambassador;" cute. Salla innocently acknowledges that he does all his research on the Internet. He buys into a wide variety of conspiracies and phenomena, from reptilians to chemtrails. The following is gleaned from listening to interviews and reading his various web sites. He says the ancient Egyptian rulers were alien giants as tall as 40 feet who gradually became less prominent in society as the god-kings ended their direct rule and deferred to demigods, which were alien/human hybrids who ruled for awhile before being replaced by human rulers. The Flood is the dividing line. the Book of Enoch depicts the battle between angel groups. The Flood cleansed the planet of the fallen angels, who ‘weren’t wanted’ and left on earth as exiles. At another point Salla claims the Egyptian aliens were Syrians and had a lion-looking appearance. Salla is a naive of Australia. Perhaps he has a genetic memory of his ancestors receiving the same treatment at the hands of the British. There is a genuine reptilian presence back into antiquity. There are two groups: alien reptiles and those who descended from dinosaurs. He does not buy into the Icke theory of shape-shifting, but says the reptiles use technology to disguise their looks at one point and at another says they use mind control. This mind control can be broken by psychics and cameras, so the reptilians don't get out much because a photograph can show their true nature. Using Timothy Good as his reference Salla buys off on Daniel Fry and George Adamski. he also believes Greer, Dean, Billy Meier (who has been co opted by his cult), Corso, Menger, Wendelle Stevens, Adrian, and Robert Renaud. Frank Stranges and his 'ET at the pentagon' story is one of his favorites. He says Tesla worked with Canadian Arthur Matthews, and Otis Carr. Matthews developed a Tesla scope device for communicating with ETs. Matthews was a contactee with ETs from Venus, and was told that Tesla was ‘one of them’ a Venutian baby given to his family to be raised by his family. Tesla created his stuff in his mind, then just put it together. He made a statements saying his parents were his "earth parents." Chemtrails are probably responsible for the dying off of bees. There are at least 150,000 human-looking aliens living in the United States, 30,000 in California alone. the Dead Sea Scrolls have all not been released because they prove ET visitation. There are livable atmospheres on Mars, Venus, and our own Moon. All the probes are wrong. Salla believes in the Eisenhower/Holloman air force base incident which was witnessed by over 500 people where Eisenhower met the aliens. The subject was nuclear disarmament. Eisenhower subsequently initiated his 'Atoms for Peace" program which was rejected by the Russians. There is a film of this meeting which many people have seen. All witnesses have been sworn to secrecy. Salla believes there are sixteen races involved with earthly affairs. Some have been involved with the government, some work independently. Some have evil intentions; some are good. The Tall Whites are the guys in charge. He has written several books, including Exopolitics: Political Implications of Extraterrestrial Presence and Exposing U.S. Government Policies On Extraterrestrial Life: The Challenge Of Exopolitics.